Victoria Nuland, assistant U.S. secretary of state for European and Eurasian affairs, participates in discussions on Ukraine and other global challenges, organized by the Yalta European Strategy in Kiev, Ukraine, Sept. 12, 2015. A top U.S. diplomat said Saturday that sanctions against Russia for its role in the Ukraine crisis would remain in place until a long-violated truce agreement was fully honored. U.S. Assistant Secretary of State Victoria Nuland also warned that Moscow would pay "more costs" for future violations of the Minsk peace deal. Nuland spoke in the Ukraine capital, Kyiv, to a gathering of Ukrainian and foreign political and business dignitaries. "If and when Minsk is fully implemented, including [the] return of Ukraine sovereignty of its border, we can begin to roll back some sanctions," she said. The United States and the European Union have accused Moscow of stoking the 17-month pro-Russian rebellion in Ukraine's east, and have imposed a series of economic sanctions aimed at deterring Russian military and logistical involvement. The first wave of EU sanctions came in July 2014, after analysts linked the downing of a Malaysian jetliner in Ukraine territory to Russian-made missiles. Since then, both Brussels and the Obama administration have targeted senior Russian officials with travel bans and other penalties. Additionally, Western governments have targeted Russia's banking sector and blocked Russian energy companies from access to U.S. services, goods and technology used in deepwater and shale oil extraction. FILE - OSCE Secretary General Lamberto Zannier says the Ukraine cease-fire "has being holding for more than 10 days," which is yielding the opportunity "to make progress at a political level." For his part, the secretary general of the Organization for Security and Cooperation in Europe said at the Kyiv forum that the cease-fire, which was reaffirmed by signees September 1, was being honored. 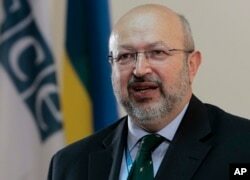 Lamberto Zannier, who recently visited the Ukrainian towns of Mariupol and Shyrokyne, expressed hope that the current cease-fire would prove durable. He said he hoped it would lead to negotiations on the implementation of the Minsk accords so monitors on the ground could perform more functions. "The cease-fire now has being holding for more than 10 days, and that's good news," Zannier said, "because that is opening now the space also to make progress at a political level, and that's opening up space also for us with monitors on the ground to reach out and to perform more functions." Zannier said that the crisis in and around Ukraine had entered a more positive phase, creating conditions to start the withdrawal of tanks and artillery systems. Russian President Vladimir Putin also said Saturday that both Ukrainian armed forces and separatists in eastern Ukraine were observing the cease-fire. Speaking in the Crimean town of Chersoneus, Putin called it the “main achievement” of efforts to find a peaceful solution to the crisis in eastern Ukraine. The United Nations says nearly 8,000 people have been killed and some 19,000 others wounded since April 2014, when rebels in Ukraine's Russian-speaking east launched their rebellion against Kyiv's rule.